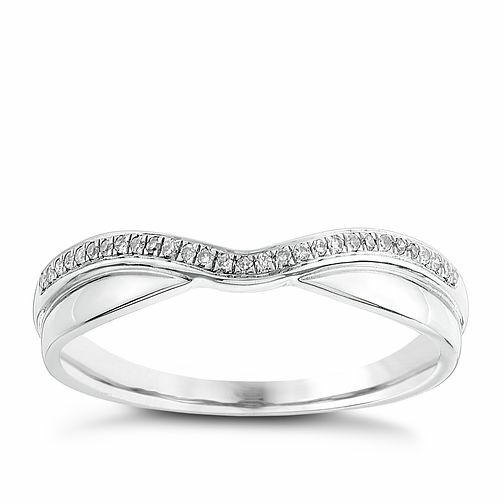 A beautiful shaped wedding ring crafted in 9ct white gold part polished and part set with sparkling diamonds. An enchanting ring to symbolise the start of your new life together. 9ct white gold, diamond and polished shaped wedding ring is rated 3.7 out of 5 by 7. Rated 5 out of 5 by Anonymous from It complements the diamond story engagement ring very well It's hard to find any faults with this item, it goes very well with the diamond story engagement ring and the part set of it being polished and diamonds makes it a really nice ring to look at.